PARCS Ltd. partners with some of the foremost leading international Playground Manufacturers to offer Fully Accessible, Age Appropriate, Safe and Functional Playgrounds in the business. Innovative Playgrounds, coupled with our over 15 years of Playground Installation and Inspection experience have set us apart as a reliable and knowledgeable leader in the Playground Industry. For anyone planning a playground, safety is of primary concern. Of course, you want to choose a reputable supplier who is meeting or exceeding industry standards. But beyond that, it is important to think about location, visibility, strength and durability. In 2013 CBC News reported that 28,000 people/children per year are injured on Playgrounds Annually. Modernization of outdated structures, proper surfacing and recurring maintenance/inspections are some of the key focal points the CSA has identified to significantly reduce injuries associated with Playgrounds. Read the entire article here. When designing and approving your playground design it is critical to consider all types of special needs: physical, sensory, mental, emotional and social. Sensory stimulation can be achieved through the use of bright colours, signs, pictures and varying textures. Surfacing is a critical component of any playground, as you should aim to achieve two objectives simultaneously; provide adequate surfacing for potential falls as per CSA Standards, and improve accessibility for children in wheelchairs or other mobility aids. Poured-in-place synthetic surfacing, engineered wood fiber and rubber improve accessibility whereas sand and pea gravel may decrease accessibility. Playgrounds are one of many avenues that are available to curb childhood obesity, improve basic motor skills, foster teamwork, and build simple hand eye co-ordination. "Playgrounds develop the fundamental movement patterns which are essential to global fitness." Installing a fully functional Playground should be considered an investment in your communities health and well being. Selecting the appropriate Playground is imperative in encouraging activity within a student body and/or community and will yield long term dividends for years to come. In order to get the most out of your Playground Systems it is imperative you select Playgrounds that are age appropriate and foster the development of core competencies within a defined age range. Child development is one of the critical components we consider when recommending any Playground Structure to a potential customer. Outdoor Play Areas/Playgrounds can assist in the development of the following core competencies; physical abilities, social and emotional development, and intellectual growth. 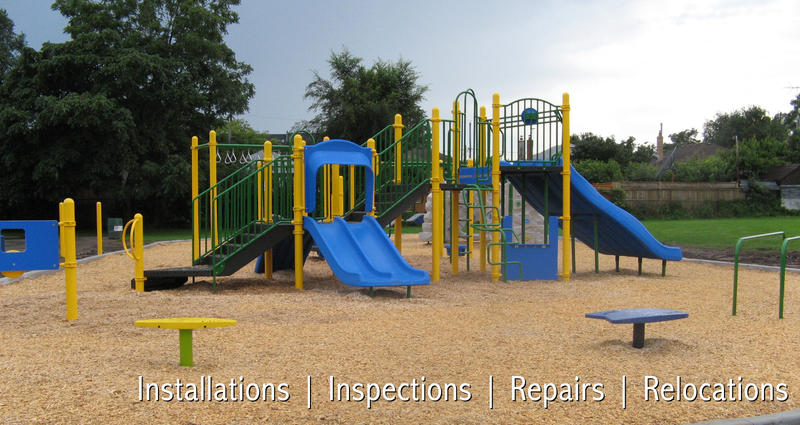 Expert Installation and Service on all Major Playground Lines.